West Hotel Sydney, located in Sussex Street, is Sydney’s first boutique hotel opening since 2012. 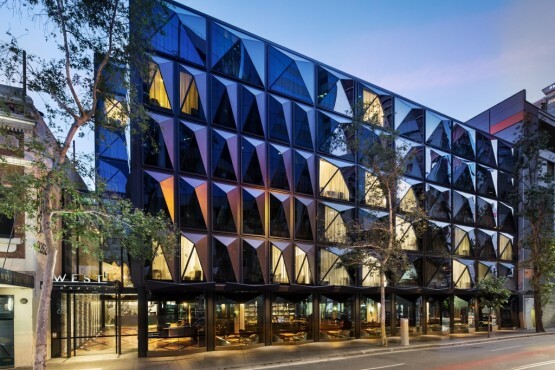 Designed by Australian Architecture firm, Fitzpatrick and Partners, with interiors by Woods Bagot, West Hotel Sydney offers 182 stylish guest rooms, including four spacious suites, a restaurant and bar, a fully equipped gym and a private meeting/dining room. With its faceted facade which looks like it is cut from a solid block of smoky quartz, it is actually two buildings: an eight-storey block sitting behind one of six storeys – with an atrium in the middle allowing light to penetrate to the base. Philip Chun provided BCA Consultancy for the project.